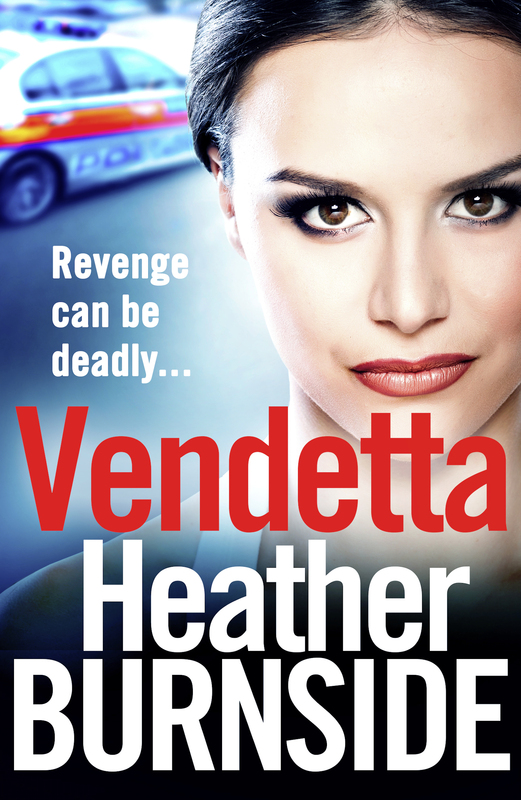 I’m excited to have Vendetta featured on Cheeky Pea Reads blog today at: http://cheekypeereadsandreviews.blogspot.com/2018/10/vendetta-blog-tour.html. 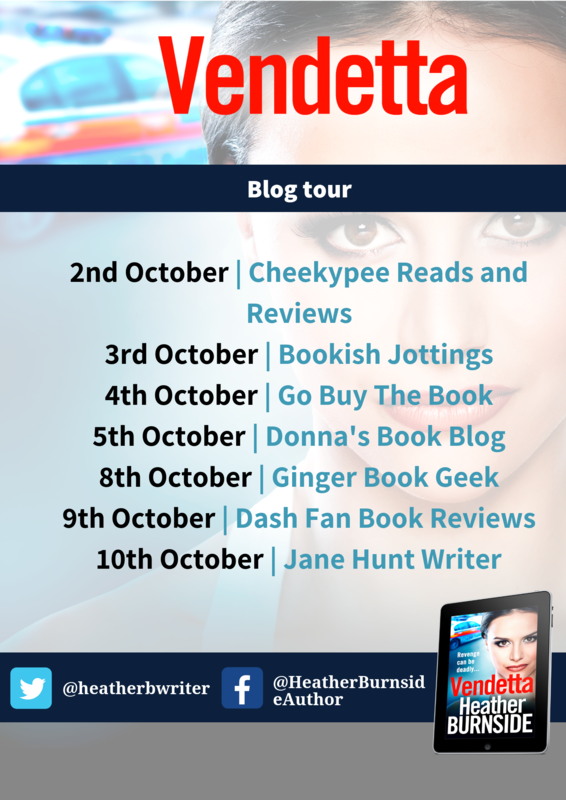 It’s the first stop on the blog tour for Vendetta, which is detailed on the programme below. The tour features reviews, excerpts and blog posts about my characters and the challenges of writing a trilogy. If you get a minute, please stop by one of the blogs and take a look. A big thank you to all the bloggers taking part. When Adele’s brother, Peter, gets banged up for GBH she reluctantly agrees to run his nightclub, The Golden Bell. Strong opposition from Peter’s thuggish number two, Glynn, who isn’t best pleased about answering to a woman, isn’t the only challenge she faces. The Manchester club scene of the 1990s is a dangerous place, at the mercy of illicit protection rackets and rampaging gangs, and, despite Adele’s efforts to keep everything legal, the club is beginning to feel like a poisoned chalice. I hope you enjoy the concluding book in the Manchester Trilogy. Today I’d like to share my thoughts about two books I read recently. My favourite genres are usually thrillers and sagas. I also love a good tale of triumph over adversity, which is a theme that traverses across many genres. However, I try to keep an open mind and try something new once in a while, especially if it’s something that has been talked about a lot or that is performing very well in the Amazon sales charts. 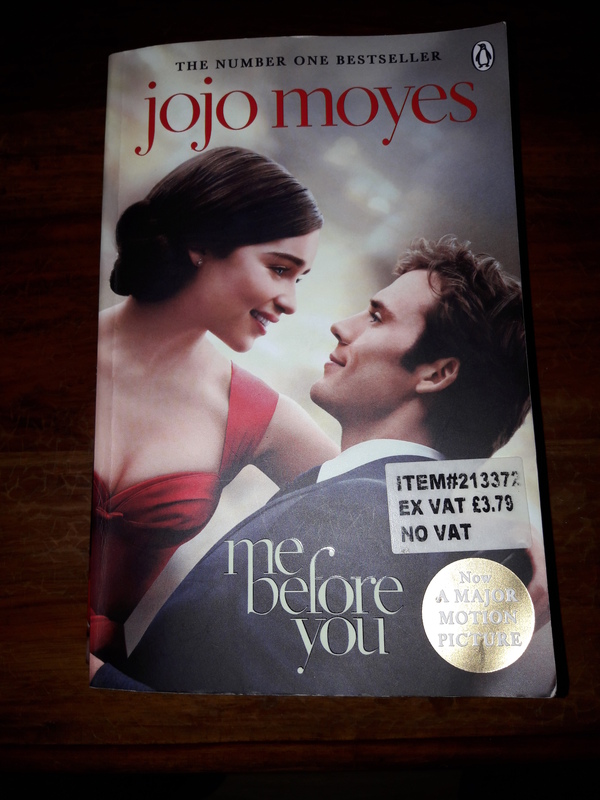 I picked this one up at my local pub (more about that in a future blog post), and the reason why I chose it was because I knew that Jojo Moyes is a very popular author yet I hadn’t tried any of her books before. I was also familiar with the title and had a vague recollection of it being a movie. Wow! This was one of those books where the appeal lies in the storytelling as much as in the story itself. Jojo Moyes is a brilliant author and I’ll certainly be reading more of her books in the future. It tells the tale of a young woman, Lou, whose life lacks direction. Will, on the other hand, is a highflyer, ambitious and adventurous, until an accident changes his life completely and he becomes a quadriplegic. When Lou loses her job at the Buttered Bun teashop, she comes to work as Will’s carer. Finding it difficult to adapt to life as a quadriplegic, Will is embittered and has given up on life. At first he is antagonistic and patronising towards Lou but she eventually wins him round. There is a lot more to the novel than that but I don’t want to give too much away. I found this book deeply emotional, which really drew me in. The story was told with a sensitivity and perception that only the most skilled of authors could pull off. Jojo Moyes is truly a talented writer. But the book wasn’t all pathos; there were touches of humour that helped to break up the bleaker moments. I especially liked the author’s witty comments regarding the love-hate relationship between Lou and her sister, and Will’s sense of mischief. As I read the book I could actually visualise it being played out on screen and it left me wondering whether the movie is in sympathy with the book or whether the producers have altered parts of it. Having read a little about the film since, I note that it caused a backlash because of its insensitive approach. That’s a shame because I didn’t feel that the book was insensitive at all. I can honestly say that this book touched me more than anything I’ve read in ages, and I’ll definitely have to watch the movie version to see what I think. I was drawn to this book for two reasons. Firstly, it’s a bestseller, and secondly, it’s the ultimate tale of triumph over adversity. 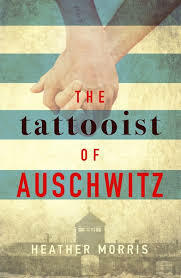 Heather Morris gives the reader an insight into life inside Auschwitz and Birkenau as seen through the eyes of the prisoner of war camps’ tattooist. The book definitely made an impact on me as it transported me to that time and place and, although most people are familiar with the hardship suffered by prisoners of war, this book lays it all bare. The author actually interviewed the tattooist so the book is told from his point of view, revealing what life was like for him and the other prisoners. The Tattooist of Auschwitz is undoubtedly harrowing but I felt that it lacked the emotional depth of Me before You. Having read the two books in quick succession, it did make me wonder whether this was due to differences in writing styles or whether it was a conscious approach by Heather Morris. Perhaps the emotional depth had to be lacking, otherwise the whole novel would have been deeply disturbing and depressing. Furthermore, the writer’s matter-of-fact approach may have been a reflection of how hardened the prisoners had become to the harsh regime. As it was based on the tattooist’s own story, it was necessary for the book to reflect his thoughts and feelings. In fact, in the Afterword written by the tattooist’s son, he describes how his mother reacted when, many years after their release, they lost their home. He was curious as to why she was singing and had a smile on her face, and she explained to him that after surviving the prisoner of war camps they could deal with most things. Both of these books were the types of novels that left me pondering long after I had finished reading. That’s the sign of a really good book, I think, and I highly recommend them both. I’ve been meaning to write this blog post for some time to acknowledge the part that the Writers Bureau has played in my writing career as this is where I started out. I would therefore like to begin this post by saying a massive thank you to The Writers Bureau for all the invaluable skills that I learnt during the diploma course. I studied with them between 1999 and 2002, and the skills and knowledge that I gained have been invaluable ever since. There are many people who say that writing is a skill that cannot be taught but I strongly disagree. 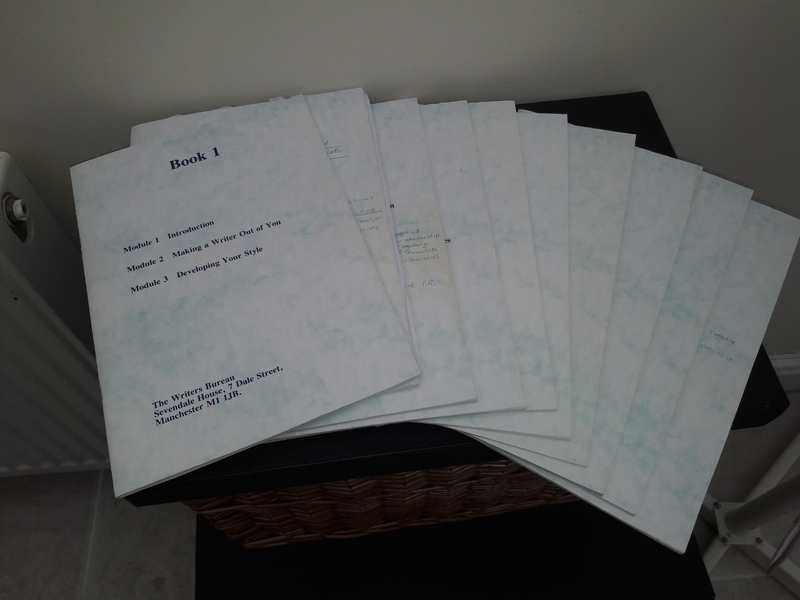 During my studies I learnt writing techniques that have stood me in good stead not only as an author but also in my previous career as a copywriter. In terms of fiction writing I learnt many writing rules and techniques including: viewpoint, creating atmosphere, building suspense, creating realistic characters, show don’t tell, writing good dialogue, outlines, pace, conflict etc. etc. There are many others but it was a long time ago and I can’t recall all of them offhand. I am sure they have stayed in my subconscious though so that I automatically utilise what I learnt on the course. The Writers Bureau also suggests reading a wide range of well-written novels because it helps to improve your writing style. By doing so, you can see the approach that other authors take, and how they utilise their writing skills. 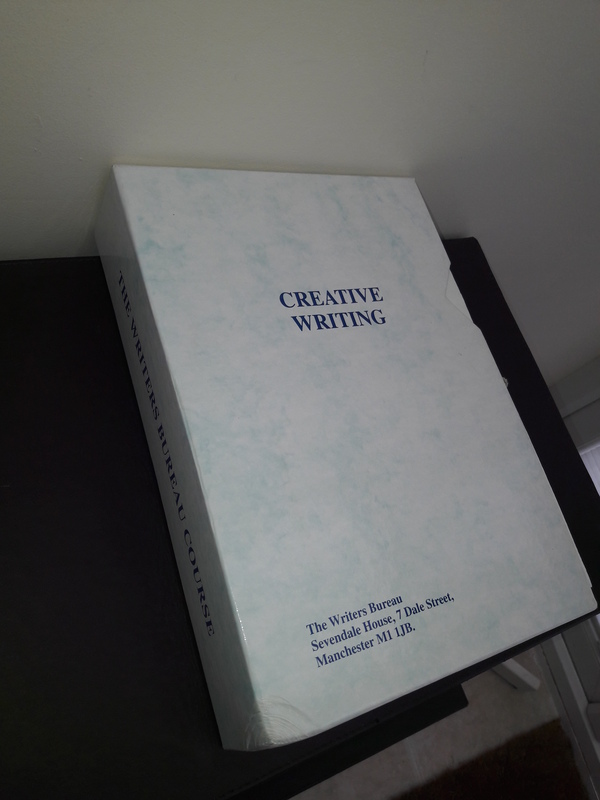 But the Writers Bureau diploma is much more than a creative writing course. It’s very comprehensive and also covers article writing, non-fiction books, biographies, writing for trade magazines, and journalism. On the fiction side of things, as well as novels, there are short stories, writing for radio, writing for the theatre and writing for TV. What I loved about the course was that the tutors encourage you to submit your work to publications so that you can earn income from your writing while you are studying. In fact, the Writers Bureau guarantees that if you don’t earn the cost of the course back by the end of it, they will refund your fees. The flip side of this is that I did become inundated with work at various points of the course. This is because, if you have an article accepted by a magazine, for example, then it makes good sense to follow it up with another article while your name is still fresh in the editor’s mind. That means that as well as studying for the Writers Bureau diploma you can also find yourself busy writing various magazine articles at the same time. It can also become a little frustrating as the course introduces you to so many types of writing that you often only write the opening chapters and a synopsis before you have to push on with the next course module. Having said that, there is no time limit for finishing your diploma (from what I remember) and it means you have the makings of a large body of work, which you can return to in the future. The Writers Bureau diploma is completed on a home study basis so students can study at their own pace. Each student is allocated a personal tutor who gives feedback on their work and makes suggestions regarding ways in which it can be improved. I found this personal touch very helpful. It was while I was studying for my diploma with the Writers Bureau that I wrote the first three chapters of a book called Nightclubbing’, a chic lit novel about two twenty somethings with a colourful social life. That was a long time ago. At the time I sent it to various agents and publishers as suggested by the course tutors but wasn’t successful. However, I did have some success with magazine articles so I put the novel to one side and pursued the magazine route for some time. Eventually, I stopped writing magazine articles and transitioned into a copywriter and proof-reader, setting up a writing services business. The diploma gave me the confidence to do that and to pursue opportunities for paid work. I enjoyed my time as a copywriter and proof-reader but I discovered on the writing course that my forte and preference lay in writing novels and I always intended to return to that one day. As well as wanting to finish the novel, I wanted to finish a non-fiction book that I had also started during the course. Eventually I did so and, although I didn’t have much success on the non-fiction side of things, my first novel was well received. By this time I had left the novel for several years and when I returned to it I changed it completely. What had started out as a chic lit novel entitled, Nightclubbing, became my first gritty crime novel entitled, Slur. I’ve since realised that gritty crime is definitely my genre of choice although I’d like to write at least one thriller in the future too. Although I originally self-published Slur and the two follow up novels, A Gangster’s Grip and Danger by Association, I was lucky enough to be spotted by a publisher, Aria Fiction. The three books became The Riverhill Trilogy, which has been republished with Aria Fiction. I have since written a further trilogy, The Manchester Trilogy, also available through Aria, and have just signed a contract with them for another three books. The first two books in The Manchester Trilogy, Born Bad and Blood Ties, have both become Amazon category bestsellers and reached the top 100 overall of Amazon UK eBooks with one of them reaching the top 50. I am sure that without the Writers Bureau I would never have had the confidence to self-publish my first novel. They taught me many valuable skills, which I put to good use every time I write. I am now lucky to be earning a living doing something I love, and it all started when I studied for my writing diploma with The Writers’ Bureau. I’m thrilled to announce that I’ve just signed a new three book contract with Aria at Head of Zeus. Again, it’s for a series of three books but I’ll probably extend the series to four books in the future. Although all of the books have a common background they will each tell a different story. Book one will introduce the characters and setting, and each subsequent book will focus on one of the characters’ own story. I’m already making progress with the first book, which will be available next summer. In the meantime, Vendetta, book three in my Manchester trilogy is due to be published on 2nd October, and is currently available for pre-order from Amazon. If you haven’t yet bought your copy, here is the link: http://viewbook.at/VendettaMcr. I recently had the pleasure of meeting Sarah Ritherdon, Editorial Director at Aria. Sarah has worked closely with me virtually since I signed up with Aria for my previous contract. She is brilliantly supportive to work with and a great editor who is able to spot areas of my novels that can be improved and make useful suggestions. It was lovely to be able to put a face to the name. I’m very excited to be working with Aria again, and will keep you updated regarding the publication of new books. This is a post I’ve been meaning to write for some time. 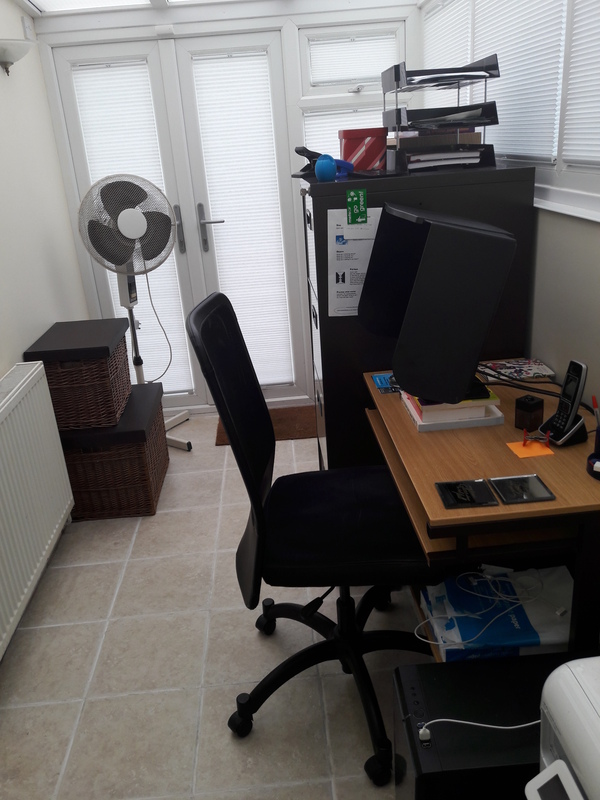 It’s now eight months since I moved house and I’ve set up an office in the back of the house so I thought I’d share some pictures with you. The room is actually a small conservatory which was lovely and cosy in the winter but has been too hot in the current climate. Fortunately I’m on Google Drive so I’ve been able to upload my work to the cloud and work on my laptop in a cooler part of the house. Although I’ve had blinds fitted to all the windows in the office and a screen guard to stop glare from the sun, what I really need is a roof blind. It’s on my list of things still to do/buy in my new home and I expect that by next summer I’ll be sorted. Then, if it’s still too hot I’ll probably add a small air conditioning unit. Apart from that the only other thing I want to change is to swap the large cabinet for a smaller one as it dominates the room at the moment. However, that would mean yet another clear out and I’ve had enough of those for the time being. I’m one of those writers who is happiest having a separate area of the home where I can work uninterrupted. There is always so much to do when you move house but at least for now I’ve got a work space which is comfortable most of the time, and which has the potential to be a pleasant, self-contained work area in the future. I am delighted to reveal the cover for the third book in my Manchester trilogy, Vendetta. It will be published on 2nd October but the Kindle version is already available for pre-order on Amazon by following the link: http://viewbook.at/VendettaMcr.